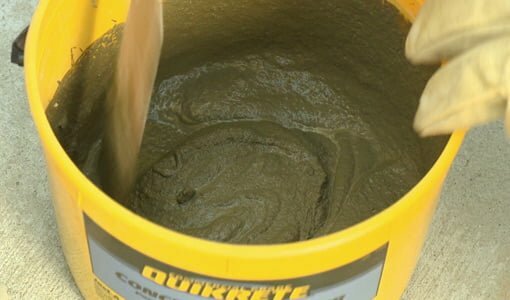 To mix Vinyl Concrete Patcher, add about 10 ounces of water per five pounds of Vinyl Concrete Patcher by pouring the Vinyl Patcher into the water. The proper water ratio is an important factor in achieving a successful repair. The more water added during the mixing process, the weaker the bond strength and compressive strength will be. Using a margin trowel, mix the Vinyl Concrete Patcher for three to five minutes. After a lump-free consistency has been achieved, allow the mix to sit undisturbed for about five minutes to provide time for the polymer to fully activate. Remix the Vinyl Concrete Patcher prior to applying. Additional water may be added in small amounts to achieve a putty-like consistency. It is important not to add more water after the material has begun to set, as this will weaken the mix and can cause cracking or scaling.